Let’s dissect this Apple supplier’s business with four simple charts. Skyworks Solutions (NASDAQ:SWKS) is best known as one of Apple's (NASDAQ:AAPL) top suppliers. The chipmaker makes RF chips for the iPhone, Samsung's flagship Galaxy devices, and a wide range of other smartphones. The popularity of the iPhone fueled Skyworks' 70% rally over the past five years, but recent concerns regarding iPhone sales peaking caused the stock to drop nearly 20% this year. Are those concerns justified or overblown? Let's take a closer look at Skyworks' business with four key charts to decide. How does Skyworks make money? Skyworks doesn't disclose exactly how much of its revenue comes from Apple. In its 10-K filing for 2015, it discloses that "one customer" (likely Apple) "accounted for greater than ten percent" of its sales. Last year, Oppenheimer & Co. analyst Richard Schafer estimated that Apple orders accounted for 35% to 40% of Skyworks' top line. To diversify its top line away from Apple, Skyworks started selling communications sockets and telematics solutions for connected cars, modules for smart home platforms, and media streaming solutions for various devices. It also shipped chips for DJI Innovations' drones and scored design wins in major Android devices and smartwatches. This chart, from Skyworks' recent investor presentation, illustrates the declining importance of the smartphone market to its long-term growth. Skyworks, like many other chipmakers, believes that the Internet of Things (IoT) market, which consists of everyday objects connected to each other, will soon become a more important battleground than smartphones. A core part of Skyworks' IoT strategy is to penetrate smart homes and connected cars. During its last investor presentation, Skyworks stated that it had already scored design wins in Nest's smoke detectors and thermostats, Honeywell's alarm systems, Sylvania's wireless lighting systems, Amazon's streaming media platforms, and Sonos' audio systems. Within that market, Skyworks expects more advanced streaming set-top boxes and media gateways -- which will require more of its chips -- to become central "hubs" in smart homes. Skyworks expects that growth to surge through 2018. In the auto market, Skyworks believes that connected cars will account for 75% of all shipped vehicles by 2020, bridging the gap between traditional vehicles and semi-autonomous ones. Within that market, Skyworks' chips will power advanced diagnostics, telematics, infotainment, and navigation systems. A large number of mobile users still haven't upgraded from 3G to 4G smartphones. Therefore, the number of monthly LTE subscriptions worldwide could rise from 500 million in 2014 to 3.7 billion by 2020, according to Ericsson. These upgrades benefit Skyworks because 4G devices require more of Skyworks' analog chips than 3G ones. 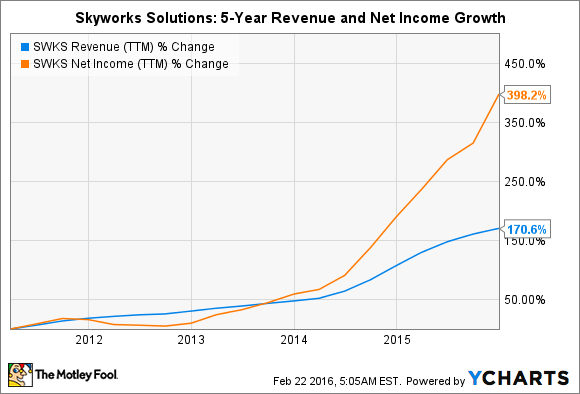 The following chart illustrates how much more revenue Skyworks can generate per device when users upgrade. While that forecast looks rosy, investors should keep an eye on RF360, Qualcomm's (NASDAQ:QCOM) new RF joint venture with TDK. That JV will develop RF chips for various devices, new sensors, and wireless charging tech for smartphones, drones, and other devices. If Qualcomm integrates those technologies into its low-end reference designs, it could throttle demand for Skyworks' One Mini modules. Last but not least, Skyworks' top and bottom line growth have remained robust over the past five years. Although past performance doesn't guarantee future returns, Wall Street doesn't seem terribly worried about Skyworks' dependence on Apple or potential competition from Qualcomm. Analysts, on average, expect Skyworks' revenue to rise 5% annually in fiscal 2016 (which ends on Oct. 2) and accelerate to 12% growth in 2017. Earnings are expected to rise 9% in 2016 and 15% in 2017. Those estimates indicate that Skyworks will successfully pivot away from the smartphone industry and profit from the growth of IoT markets. Is Skyworks a worthy investment today? In my opinion, Skyworks' sell-off this year was an acute overreaction to Apple's slowing iPhone sales and Qualcomm's RF joint venture. Yet investors overlook the fact that Skyworks' RF chips still have a "best in breed" reputation among smartphone makers and has already scored key design wins in smart homes and cars. Skyworks' stock also trades with a 5-year PEG ratio of just 0.5. Since a PEG ratio under 1 is considered undervalued, Skyworks stock looks very cheap based on forward earnings estimates. Moreover, the stock also pays a decent forward annual dividend yield of 1.65%. These facts and fundamentals indicate that Skyworks stock might be a good long-term buy at current prices.